I exhibited all distinctions which I receive for work on my pages here. I expect, that they become more and more with time(*g*). The pages which I had made out or administrates are: http://www.tiger-online.org (and aliases), http://www.tigerforum.de and http://www.tigerportal.de !! The pages of the Zuercher animal protection are occupied of course not only with the tiger. All threatened kinds have here a home. The page is formed clearly and into all important European languages, available. 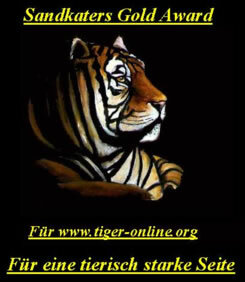 A jury decides over it, whether an applicant right receives the tiger award to show on its page. You should take the time from themselves for a small visit. Lukanias cat zone is a page that attended itself full and completely to the cats, too. Although it no doubt honor around our "normal" room tigers goes and less around the large cats. Topics round as behavior and many other topics around the "best girlfriend" of the human being - the cat *g* - became respond. I looked up onto yours page frequently, becouse I was not able to look at everything at the same time on a day :-/ yes a little flashy that color and the blue to the left blind very much. However otherwise I find your whole page correctly and super class:-) there you provid a lot of information to the tiger on yours page. So is striking it not genuinely very heavy for me to give my Spannky Wildcat Award with all five stars to you, since your pages are a visit worth always. I always expect that you join so on, further more :-) and wish that you always will have joy next to it. Now I request you with yours page another much success and natural a lot of visitors and entries. 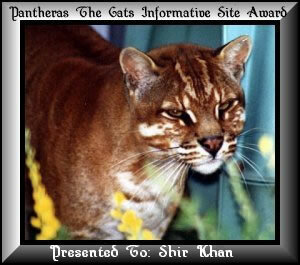 Spannky's pages may offer also a abundance of information about big cats, dogs and many other animals. Its page is very good arranged and worth neat - that is always a weaving excursion. I thank you (Spannky) for this perfect award and I have to work of course before your advice to deal. these awards with the honor in which they were given. 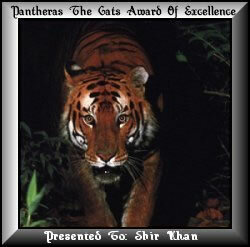 Thank Pantheras for this very beautiful Award. Every new Award is as beautifully like the first one for me. The special on this Award is, that the it was the first loaned to me from an English languaged foreign country. 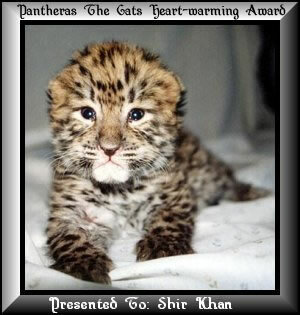 Pantheras page is very clear and formed with love. You can recognize next to it easily, that Pantheras love the big and also small cats of this world. You should reveal your English and visit Pantheras. You applied for my Award, here now mine subjective evaluation. I evaluate your page with 28,5 points total. Evaluation per criterion 1-6 (school system of notation CH). Thank Hans for this extraordinary award for me. I work on the improvement of the design and the charging time of my page. The contents are of course in the center of my efforts *g*. Who also finds my page so beautiful, as Hans has that, you should also visit the pages of Hans yourself. These pages are opened of nice beaut and many ones offer interesting contents, too. For pages those make the net richer those were written with heart & brain, you receive the HEART & BRAIN - AWARDS 2002 in silver! Thank for Wolly for this Award of breath-taking beauty. I'am pleased with every Award, as would be it the first one. And I am sure of me, that might already unite the Wolly-Award may know, that he yes, is not straight ones unknown *g*. 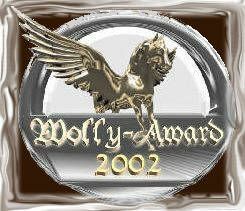 Each which would like can even apply itself for the Wolly-Award if he/shie look around at Wollys pages. I received this award from Reina van Ginneken. Each which operates a page, that busy itself with the big or small cats too, can also apply itself. Thank for this distinction of my pages of breath-taking beauty to Reina. Tiger-online.org is a really fabulous page, you find quite everything out about tigers and still a lot more. Even if you must run sometimes might unite detours, you arrives again and again a promising link to that or other fabulous contents. Design is formed homogeneously and mostly brought up with different pictures and photographs. I like the effort of shockwave especially well (with/without/over-testing) and the field to politics & protection is especially emphasize in my opinion. The home page creates what only a few pages succeed - it enthralls the visitors! Tiger-online.org - in this home page, two souls are embedded that of the Web master and on the other hand, that of the tiger. And as showed it for itself that the webmaster received a silver-award. 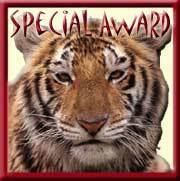 On account of fabulous services, I now would like to give a joy with the special-award to the tiger. 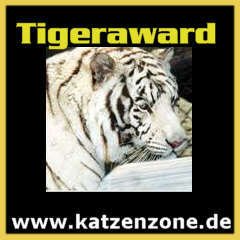 Here was created a scientifically home page about tigers which is presented in German and English language. It might still be recorded that visitors can also choose two operating modes as addition. The graphic is very good, the navigation also good but habituation is needed, the charging time is good in spite of the over-size size. Award presentation and the general impression is very good, too. Scoring 85 became achieved from 100 and I am pleased to give the EFW home page Award,Gold with the best congratulations to you. We can only request Shir khan to enlarge the HP even further and many interested visitors want to notice these HP, so they can learn very much. I would like to thank Erwin Fiala, which gave this beautiful award to me, cordially. His own home page has an old "friend" of the cats, the dog, on subject. Too the hobby radio operators will feel well there. The page is therefore always a visit worth. On reason of your application for the award, I looked at your side and to the end I come to the conclusuion that you earn my gold-award. At this place, I would like to thank the sand tomcat for this beautiful award and would like to present it the public. If your want and got a few minutes of time, you can look at the home page of sand tomcat.